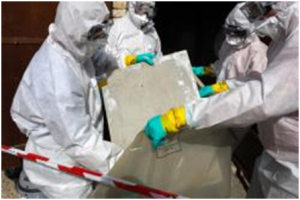 This course highlights where asbestos can be found and gives the knowledge around what to do if it is discovered. Anyone who works in an environment where Asbestos may be a hazard. Assessment is via an end of session multi choice questionnaire paper. Each delegate will receive an Aid Training certificate. The cost of this course for up to 12 candidates is £425.00 + vat. This price includes certification and a manual for each student. Would you like more info on Asbestos Awareness Training? If you need any help or have any questions regarding Asbestos Awareness Training, you can call us on 01985 843100 for a chat. Alternatively, drop us an email info@aid-training.co.uk and we will get in touch.